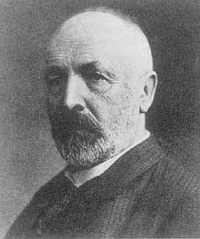 Georg Cantor (1845-1918) was a Russian-German mathematician who is considered one of the greatest ever because he created the field of Set Theory. His motivation was to understand the Christian concept of eternity. He dedicated his last publication to a passage from 1 Corinthians: "The time will come when these things which are now hidden from you will be brought into the light." Cantor's work is an example of the best of the public, as he never lectured at a university and was even vilified by several leading mathematicians of his time, such as Henri Poincare. Even some theologians opposed Cantor for the implications of his work in understanding the nature of God. Yet Cantor's revolutionary work proved to be the most influential of all, and David Hilbert praised Cantor as the greatest mathematician since before Leonard Euler. Hilbert declared, "No one shall expel us from the paradise that Cantor has created for us." Cantor was the first to "put infinity on a firm logical foundation." His invention of set theory helped him achieve this extraordinary goal. He "described a way to do arithmetic with infinite quantities useful to mathematics." Cantor showed that there are "infinite sets of different sizes, some of which are countable and some of which are uncountable." Cantor invented the concept of cardinality and ordered pairs, and proved that some infinities are larger than others. Cantor's best known proof is his technique of Cantorian Diagonalization, a method useful to prove that the real numbers are larger in cardinality than the integers. He is also known for his Cantor Set and Cantor Intersection Theorem. The set of integers (or their equivalent) is the smallest infinite set. Cantor's "Continuum Hypothesis" is the conjecture that the set of all real numbers is the second smallest infinite set. Paul Cohen proved in the 1960s that the "Continuum Hypothesis" can neither be proved nor disproved within conventional (axiomatized) set theory. Stated another way, it is possible to develop a non-Cantorian set theory that negates the "Continuum Hypothesis." ↑ Cantor's mother was a Russian Catholic, while his father was a German Protestant; Cantor was born in Russia but moved to Germany, where he was never comfortable, as a boy. ↑ Cantor's founding of Set Theory was in several papers he wrote between 1874 and 1897. This page was last modified on 30 April 2018, at 19:41.